Forms are an essential part of any interactive website. Without forms, your options for interacting with a large number of viewers are very limited. It is important for any successful online business owner to be able to create a variety of forms that interact not only with your customers but also with the database for your website. We will show you how to install and use the most versatile free Joomla form making tool on your website. This tool is called Breezin Forms. Forms are not difficult to master. But creating them will take some time to learn because forms have a language all their own. So the question is why should you go through the hassle of learning this language? One of the key aspects of a modern interactive website is being able to interact with the viewer of your website. Feedback forms which are easy for your viewers to fill out and send back to you play an important role in this process. But to be truly useful, these forms should also be capable of being tied to a data base where the responses can be processed and reports produced. In the past, attaching a database to a website was very difficult to set up. One of the key benefits of Joomla websites is that they are all database driven. All Joomla websites therefore already come equipped with a (hidden) database. So all you need to do is tie a form to this data base to join the modern online interactive website revolution. In the past, forms were also quite difficult to create because each field in the form had to be coded manually. Thankfully, there is a free Joomla extension that makes writing forms not much more difficult than writing Joomla articles. The extension is called Breezin Forms. This and the next three articles will review how to install Breezin Forms on your website and use it to create a detailed Contact Us form and a custom registration form and post them on your website. 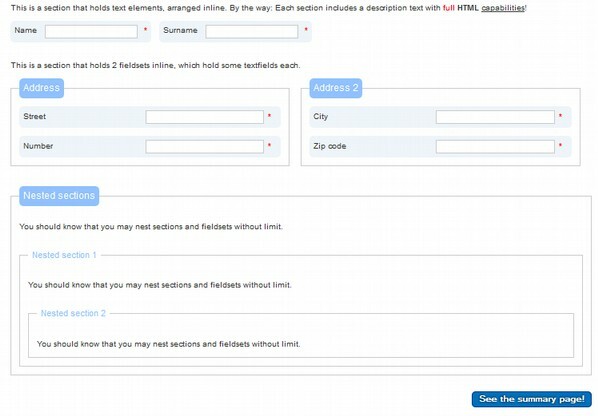 There are more than a dozen Form Extension options for Joomla. They range from easy but limited form generators to very complex options that are well beyond the ability of most non-computer programmers. There is one free option which is not difficult to learn and has unlimited design potential. If you want professional looking forms, then it is worth the time to learn how to use a Joomla extension called Breezin Forms. Their paid commercial option is also very popular. But for now, we will start with their FREE version which will do almost anything most business owners would want. First, Breezin Forms gives you the ability to divide your form into as many sections and pages as you need. This is particularly important for complex forms. You can also add descriptive images and text to every section of your form. Second, Breezin Forms offers 14 types of form elements to choose from. We will review these form elements in the next section. But it is essential to have a wide range of elements to build a useful form. Third, Breezin Forms offer a fully integrated Recaptcha system for cutting down on spam. Fourth, it offers many free themes to customize the appearance of the form. Fifth, it offers a form validation system to insure that users submit fully completed forms. Sixth, user data gathered with Breezin Forms is automatically transmitted in email notifications and/or in a downloadable data base exportable into CSV for processing with Excel or Libre Office spreadsheets. Seventh, it offers the ability to create, copy and move form templates and themes from one website to another. Last and most important, this component provides detailed documentation on how to use complex form functions and solve common problems. Thankfully, Breezin Forms makes this process easy to learn. Google also offers an easy form builder that stores forms and form data in Google Drive – which comes free with any Gmail account. The problem with this approach is that Google controls your data rather than you. At any moment, your data could be gone. Second, Google mines data from your users to direct ads at them. It is how Google makes money. Using Google Forms means you are sharing user data with Google. The only honest way to assure your customers that “You do not share their data with anyone” is if you keep that data on your own securely encrypted database associated with your own website. As more folks become aware of the drawbacks of handing over all of their data to Google and Facebook, folks will learn to avoid Google Forms. Click on DEMO. Then scroll down the page and click on the All Elements Example (with default theme). This is an example of all available elements in BreezingForms. The text you see here is a page intro text, every page may have an intro text where you are free to use HTML The awesome thing about BreezingForm's QuickMode is, that you don't need to handle complicated layouts, you just create them while doing your form. BreezingForms makes sure that everything looks good. There are a dozen free themes that come with Breezin Forms. Click on the right menu to see them. If you need a different look, choose from the available themes or just create your own theme! This form shows you the power and flexibility of Breezin Forms. We will create a similar form as shown below. There are seven extra free themes in the additional themes folder. There are also several free themes preinstalled with the Breezin forms component. There are also some sample forms we will be adding later. Click on extensions to open this folder. Inside of the addons folder are a Joomla Module extension and a Joomla Plugin extension which you can use to put Breezin Forms inside of a module or an article with just the click of a button. We will not be using these because we will be creating a separate Breezin Forms page with the component. Click on the READ ME, and you will see the following. BreezingForms => Configuration => Package Installer and upload one of the XML files. Each XML file contains multiple forms that you can use right away. The theme(s) will then be accessible in the QuickMode editor. The Sample Forms include some Quickmode Samples which we will eventually download. And the Additional Themes also have some themes we will eventually upload. But first we will upload the Breeezin forms component using the Extension Manager. Log into your Joomla Administrator Control Panel and go to Extensions > Install. In the Upload Package File section, click on the Browse button and navigate to the unzipped Breezing Forms folder. Inside this folder, select “extensions”. Then select com_breezingforms zipped folder. Click on UPLOAD FILE AND INSTALL. The screen should say: Installation successful. Next find BreezingForms in the Components menu, and finish the installation process. Then go to Components, Breezin Forms. Joomla components are like small Content Management Systems. The Breezin Forms component divides their files into 8 separate sections. We will only use three of these sections. In this article, we will cover Configuration. In the next two articles, we will use Manage Forms. And in the last article, we will use the Manage Records folder to review how to download data from your forms. We will not cover the other four folders as they are not needed for 99% of what we will use forms for. When you first open the component, you will see the Installation Step 2 screen. Website hosts will usually allow you to set up these email addresses for free. You can also arrange to have any mail sent to them or by them to be forwarded to your normal email address. The account is created in Cpanel. Then click on More, Access Webmail. Then in the upper right corner, next to your email address, click on Forwarders. Then click Add Forwarder and forward your website email to your secure Proton Mail account. Then click Add Forwarder. 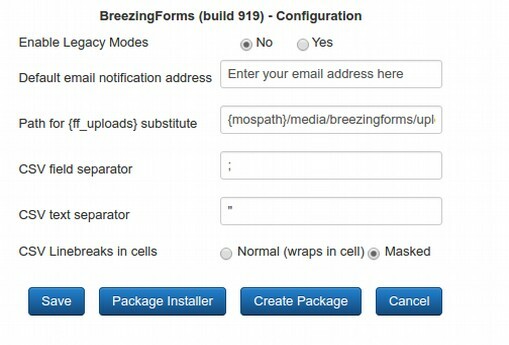 Then log out of cpanel and add your website connected email address to Breezin Forms configuration. Then click Save. This takes us to the files screen. But there are no sample forms. To get these sample forms, click on Configuration in the side menu to return to the Configuration screen. Then click Package Installer. There is already one package installed to control the basic functions of Breezin Forms. But we also want to install the Sample Forms. Click Choose File and go to the Breezin Forms folder in your website Extensions folder. Then click on the Sample Forms folder to open it. There are two completely different kinds of forms in this folder. Click on Quick Mode Samples to select this XML file. Then click Open. Then click Install Package. Then click Close. Then click on Manage Forms in the side menu. Then click Package, Select from list and select Quick Mode forms. Now we have a table of 4 sample forms we can copy to create our own forms. Before we start building forms, we also need to put our website email address into Joomla Configurations. Even when you have this email address, you have to tell your Joomla Website that this is the email address you want the emails from the Breezin Forms program to be sent from. To do this, in the Joomla Administrator panel, go to SITE> GLOBAL CONFIGURATIONS > SERVER and look for Mail Settings and enter the needed information into Mail From and From Name. Then click Save and Close. To go back to Breezin Forms, click Components, Breezin Forms, Manage Forms. 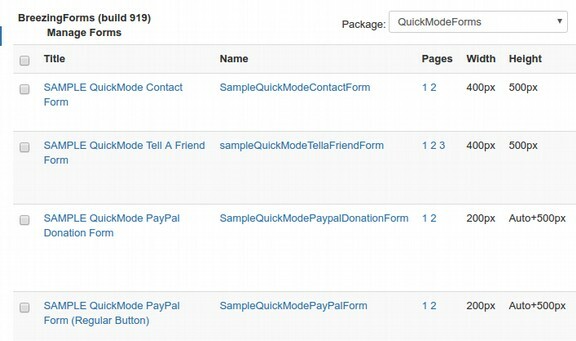 Double Click on the SAMPLE Quickmode Contact Form to open it. It allows us to edit the text and images at the very beginning of our form. Click on Name. This screen sets the properties for the first form element which is called Name. The Email field and Message field look very similar but use different types of form elements. Click Close to close this form. 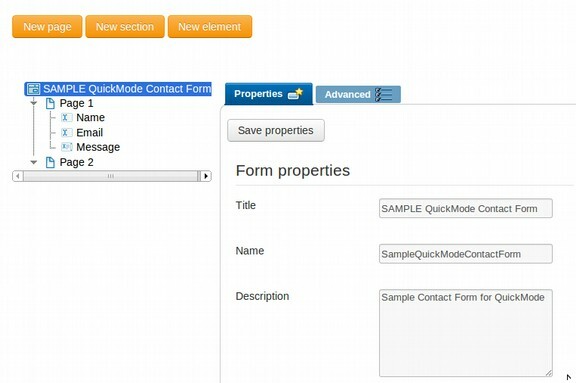 In the next article, we will review how to create a new simple Contact Us form using the Quick Mode which is in the Manage Forms section of Breezin Forms. This finishes the configuration of Breezin forms. We are now ready to create our first form.